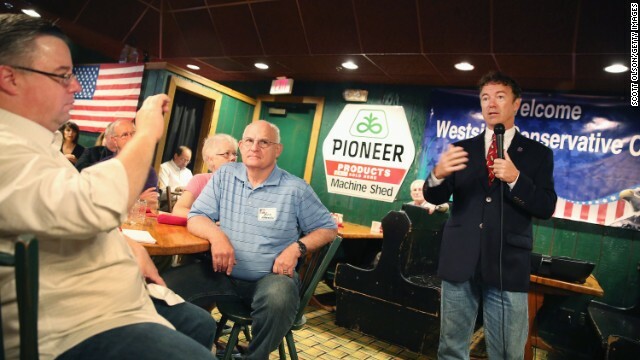 URBANDALE, Iowa (CNN) - Rand Paul wears his political ambition for all to see. Look no further than the tie he sported during a three-day trip to Iowa. It had yellow images of corn, the crop that epitomizes politics in the first-in-the-nation caucus state. "And by coincidence, I have one in the shape of South Carolina," the Kentucky Republican said Wednesday, drawing laughs. He was speaking at a Republican breakfast outside Des Moines at Machine Shed, a Midwest restaurant chain where the waiters wear overalls and drinks are served in Mason jars. "Bush tolerated a tirade of leftist attacks from the Corporate Media Monopoly and his ratings are the same as Obama's, within the margin of error." Really? Is that why the NYT is just now this week promising to finally use the word "torture" to describe things that are obviously "torture" from now on? Is that why the MSM outed Plame on behalf of Cheney and ran with the "Iraq has WMDs" lie without ever giving it the slightest scrutiny? Is that why the entire MSM basically sat back and accepted Dubya's "I'll give you the questions you ask me or you ask me nothing" approach to press conferences, never really complaining about it? Is that why CNN had special segments drooling over how cool it was that billions of phone records were being collected under the Patriot Act when Dubya was in office, but then turned rabid when Obama continued the program? The list of IKOIYAR is endless and he only reason you think the media is biased is because it everything looks "leftist" when viewed through the prism of Faux News and partisan ideologue dogma shovelers like Limbaugh, Luntx, Rove, Breitbart, WND and Red State. Yep, it's Friday at CNN. Again, Rand has all the substance of a chimpanzee hand-signing its understanding of calculus. Of course, that will also be true for the rest of clowns that tumble out of the [R] campaign clown car. But hey, the [R] base just loves a show of reinvigorating purposeful stupidity....after all the base worships just that, on their own, between elections. I don't know if I would vote for Rand but he is always interesting. Reminds me of a place right in downtown Rutland, Vermont. [that would be smack dab in the middle of prime New England ski country] They nicknamed themselves, "The Home of the Pounder" because they served 16 oz. mixed drinks, 4 shots in all. Really? Is that why the NYT is just now this week promising to finally use the word "torture" to describe things that are obviously "torture" from now on? Is that why the MSM outed Plame on behalf of Cheney and ran with the "Iraq has WMDs" lie without ever giving it the slightest scrutiny? It turns out that the source of the WMD intelligence was some alcoholic named "Curveball" in some German jail. Yep, it’s Friday at CNN. A Man of Strongly Held Principles-Having to "refine" his Message. Isn't that an oxymoron ? I do not think that would take much work. Anything is an improvement over the chump running things now. He makes decisions about as fast as my daughter does shoe shopping. He manages to be Indecisive and wrong consistently. Mason - You just lost the debate, because you broke one of the most important rules of debate: stay on topic. I do understand your need to DEFLECT off-topic when it comes to discussing the lost-cause and comedy-central of [R] presidential candidates, including Rand. But still, in a realty-based world, YOU LOSE!! Is it no wonder then that you varmints avoid reality at all costs and instead enjoy your fairytale world over there at FoxNews?? Now, get back to your still. GIT!!!! 000h dont worry the D party has got you all where they want you ? (Brainwashed) with broken promises and have they told you enough lies yet ? I guess not ? They dont need you or never really cared for you . Now all they got to do is trick the illegals I guess they will use your money to hire translators and give them your kids summer and after school jobs dont hold your breath if your waiting on anything good id hate for you to be fooled again . "I don't know if I would vote for Rand but he is always interesting." I suppose...sort of in the same way it would be interesting if a sewage covered gnome popped out of your septic tank vent pipe while you were mowing the lawn and demanded that you give him a bath and cuddle him while calling him Susan. Mason – You just lost the debate, because you broke one of the most important rules of debate: stay on topic. "off topic" is where GOP / TP run when presented with the facts. liberals: the hearings, even Issa's has debunked the most important myths? TP: Well Obama is trying to be King! liberals: In what ways specifically has he enacted any royalty laws? TP: What about his birth certificate? And what about Big Foot? "When Bush left office, the Iraq war was done, agreements were signed, elections were being held, all Obama and Clinton had to do was get a status of forces agreement and they failed to do that,"
Never ceases to amaze how misinformed you guys are. Dubya signed a SOFA. Obama carried it out. All the talk about Obama "getting a SOFA" is complete nonsense and involves the idea that he could get a new or amended SOFA to replace the one Dubya signed. He actually tried. The duly elected President of Iraq wanted nothing to do with it. Seeing as how you're quite obviously a GOPer/Teatroll, you clearly know all about how hard it is to negotiate with people who are totally entrenched and refuse to budge...after all, it's been the core of the GOP/Teatroll strategy for the past 6 years. Since the Tea Party is not really interested in governing, or making any decisions beyond rewarding the persecuted mega-rich, is anyone really surprised by their inability to present an alternative message that is not chock full of papers and ideas from the Neo-cons? Sad thing is that as flawed as they are, the Neocons are the only ones in the GOP who even want to have a foreign policy, or anything that cannot be written down on the back of a flash card. Face it, the Tea Party are a group of simpletons who are only interested in ideological purity at the expense of reality. A Man of Strongly Held Principles-Having to "refine" his Message. Isn't that an oxymoron ?" --in a plain, simple English language, republicans are the cult and GOP is the biggest CULT. TRUE, YOU REMEMBER FROM LAST ELECTIONS. SO ONLT REPUBLICAN CULT LEADER LOST. And named mitt the twit.